Ready for an extremely crunchy topic? No ‘poo! No, I am not talking about not going to the bathroom, I am referring to the method of not shamPOOing your hair. Before you start thinking, EWW, gross! Let me explain. No ‘pooing does not mean that you are not washing your hair. Although some die hard crunchies will go that far and only wash with water. It does not begin that way and it does not have to end that way. Most no ‘poo fans stick with using baking soda and vinegar. Yes, the same ingredients that you use to clean your house can clean your hair! Go figure. Baking soda becomes your “shampoo” and vinegar becomes your “conditioner”. Shampoo: 1 tablespoon baking soda mixed in 1 cup of water. Day 1: Washed my hair with baking soda, let the baking soda mixture sit on my head for at least a minute and then rinsed out. Followed with vinegar mixture, let that sit for awhile as well, and then rinsed. It all felt very strange. Washing with baking soda made my hair feel squeaky clean in the shower and obviously, vinegar did not have the same smooth feeling that traditional conditioner does. Once dried, my hair was just as clean as before I went no ‘poo. My hair did smell like a pickle factory when it was wet but once my hair dried the vinegar smell was gone. Day 2: I got compliments on my hair today! They said it looked soft and shiny! Yay, for no ‘poo! Day 5: My hair is pretty greasy. Although this is probably my fault for playing with my hair so much. Today is definitely a hat day! Day 6: Wash Day! Same baking soda mixture but this time I did half vinegar, half chamomile tea. (Note: chamomile can give natural blonde highlights, so use it only if you want to have some blonde in your hair.) My hair smelled great! I was worried about my hair not getting clean enough because it was so greasy but it came out perfect! Day 12: I have continued with the same washing method. I still use vinegar and water, although once in awhile I will use the chamomile tea. My hair is much softer and looks great! I wash every 3 days and by the third day it does get a little greasy but definitely not as greasy as it used to with traditional shampoo. My dandruff is better also. I never had a horrible case of dandruff but it has definitely improved since going no ‘poo. I love going no ‘poo! I will never switch back to the traditional stuff. This is an amazing way to wash your hair. However, I will never go completely no ‘poo and wash with only water. I could probably wash more often if I really needed it but I don’t. I hear if you do need to do a wash in between no ‘poo days then you can just do a vinegar rinse or wash with just water. I have not tried that yet simply due to the fact that I do not like having to dry my hair. There it is! Now the world knows that I do not use shampoo or conditioner. What will they think? Honestly, nobody will ever know unless I tell them. However, with how great this method is, I’ll probably be shouting it from the roof tops! Still have questions concerning no ‘poo? Check out my No ‘Poo FAQ post. Go here if you are giving no ‘poo a try and you need some troubleshooting. Sounds great! I'm going to try the No 'poo. I have been having problems with irritation of my scalp with so-called natural shampoos even those lauryl sulfate free ones. One question though, I don't use a conditioner, but what type of vinegar do you use? White vinegar. Or apple cider vinegar? I have been doing this method for almost a month now and am never going back to shampoo! I love "no poo"!!!! I've used olive oil in my hair before for a 'deep conditioner' treatment. it worked wonders. i may have to gives this a whirl though. great blog post! Ok, no poo-ers. What about really long hair? How do you ever wet comb it if you don't use conditioner? I would be willing to try this but the idea of tangles makes me stabby. Really long hair is no problem. You may need to double the recipes but that would be the only difference. I know it sounds crazy but the vinegar does work just like a conditioner (better in fact) and you can wet comb through your hair just fine. In fact, it is easier for me to wet comb now that I no 'poo then it was prior when I used regular shampoo/conditioner. I'm only into no 'poo for 4 days- 2 washes. So far, it's been wonderful. I'm really due for a trim and it was beginning to really look it. Since switching over, it looks much healthier. I'm amazed by the vinegar rinse, too. And last night I didn't do my usual dry/flat iron and let it air dry. My natural curls have returned in a much softer, nicer version. I've already switched the kids from CA Babies soap/shampoo over to baking soda too. Thank you! I'm a hug fan. Hey Brit- I have a question for you regarding going "no poo". In my line of work, I end up leaving smelling like coffee…its penetrated my hair and skin, i feel so filmy I cant wait to go home to shower. Is this alternative safe for everyday use, or every other day? What would you suggest to eliminate the coffee smell on no-wash days? Hi Marie – lol I remember you and your showers after working in the coffee shop. 🙂 I wouldn't recommend no 'pooing (at least with baking soda and vinegar) every day as that is usually too harsh for your hair. Some people can do every other day. You could no 'poo every 3 days or whatever and then do water only washes in between. Although I personally find that water only washes makes my hair looks worse, but some find it makes it look better. Of course, I'm not sure if water only would do much with coffee. You could also try just spritzing with water and essential oils (or tea) in between washes. That might be enough to revive your hair and get rid of the coffee smell. My husband has a sensitive scalp so I think this could be an option for him. But he works out 5 days/week. It sounds like he shouldn't use this every day, but would 5 days be too much? If so, what would you recommend he do on the days he works out but can't use the baking soda and vinegar? Danielle – Yes generally doing no 'poo every day (or most days) would be too harsh…although with men's hair it might be more tolerant.I usually recommend that people who work out (and "must" take showers/wash hair after)do a water only rinse. (unless the work out day happens to fall on a no 'poo day) For instance, say your husband no 'poos Sun, Wed, Sat but works out Mon – Fri. He would wash only with water on Mon, Tue, Thur, Fri. But do the usual baking soda/vinegar routine on Sun, Wed, Sat. Now if he feels that he must wash with something then he could no 'poo every 2-3 days. Most hair will tolerate that. Or he can use just a vinegar rinse on workout days. It will really depend on how he feels about his hair on workout days. If he's ok with just water then that is prefered (technically the less your hair gets wet, the better)but if he feels he absolutley needs something then no 'pooing more frequently is alright. Although I don't recommend it for every single day. My hubby and I have been doing no 'poo for just over 6 years now. I would never go back. My kids have always been no 'poo. I use apple cider in my ends (not the expensive stuff though). I love that we have eliminated yet another source of chemicals from our home. The thing that surprised me most was that I had no trouble with tangles. From someone with really curly hair being dependent on conditioner to going no 'poo was amazingly easy. So how do you keep and store the BS mix? Do you mix, for instance, a whole bottle and leave it in the shower, or do you mix a new batch before every shower? I like the idea but am having trouble conceptualizing the logistics. I just keep my b/s and vinegar containers in the bathroom along with my no 'poo containers. When I'm going to get into the shower I add the b/s to it's container and the vinegar to it's container. Then I get into the shower and top off the b/s cup. Do my no 'poo thing and rinse. Then when I'm ready for the vinegar I top that off with shower water and finish my no 'poo. I shampoo everyday – my hair gets greasy fast – would this method me to harsh to start every other day and then gradually have more time in between cleanings? The reason your hair gets greasy fast is because you shampoo so often. I know that sounds backwards but it's true. The more often you strip your hair of it's oils (which is what shampooing does) your hair thinks it needs to make even more oil and thus a continuous over supply of oil. I recommend that you at least start out by trying to no 'poo every 3-4 days. If you decide that you just can't handle that then you can try join to every other day but really focus on going longer asap. Your hair's oil supply with adjust faster this way and you don't want to run the risk of it being too harsh for your hair. Another alternative is to no 'poo every 3-4 days and then on days that you just can't stand it go ahead and cave in for a day 2 no 'poo. This way you stretch your washings but don't end up hating no 'poo. Thanks so much for the info. I tried no 'poo and still used my conditioner. I didn't think I'd notice a difference because I still used conditioner. My hair looks and feels great! I noticed that my layers stand out better and I do not need styling products. Now I will try the vinegar instead of conditioner. Of course, just before I read this yesterday, I bought more conditioner. It sounds like going 3-4 days between no 'pooing is optimal. What about showers? Is it recommended to not shower/bathe for this amount of time too, to keep skin from drying out? Or do you shower and not get hair wet? Going 3-4 days is pretty doable by most people and that is why it's the most popular. However the longer you can go the better for your hair. As for taking showers, you can shower/bathe in between no 'poo days and either not get your hair wet at all or some people like to do water only rinses. Water only rinses do have a few issues however, 1) It may actually make your hair look worse. This is the case for my hair. However for others it can look good. 2) the more often you wet your hair, the more prone to breakage it can become. As for me however, I actually only shower every 4-6 days (which happens to be how often I no 'poo now… in my earlier no 'poo days I just showered every 3-4 days). Chalk it up to being a mom of 3, lazy, or just keeping my skin from drying out (there are actually benefits to not showering often… I should do a post on that…). Hope that answers your questions. I'll be doing a post on Frequent No 'Poo Questions soon! I've been using this method off and on for a few years, and consistently again for the last six months or so. I actually mix mine (with essential oils as well) in large shampoo/conditioner bottles and leave them in the shower. Before each use, I give it a good shake and then pour on my hair. It's been the most successful and convenient method for me. Love the no poo idea. Me and my husband have been no pooing for about a month and our hair looks and feels great! I've been using natural soap (to get away from using toxins) to wash my hair since last July and its worked ok, but my hair was always super tangly and i had to let it air dry to get the tangles out. after my first no poo, i was amazed at how clean and manageable my hair was, especially after just one washing…it feels better than it ever has. Thanks for sharing all of this. I've posted my no poo "trial" on my blog too so i can share this with all my friends. I have been no poo for over a year with hair past shoulders. The vinegar really does condition somehow. Also, warm some coconut oil and massage through ends. Leave on or rinse out. It really depends on your hair. I have been experimenting for all this time. I sprinkle dry baking soda then rinse, then apple cider vinegar, then rinse or sometimes leave on. One thing is that my hair goes through dry times and lack luster times. I have noticed that if I am taking more coconut internally my hair shines more. I switched almost a year ago and have been so pleased too! Its been great for my curly hair, better than the expensive conditioners I had been using. Glad you're enjoying it too! I use a wide-toothed comb in the shower before using baking soda and have zero issues with tangles. (I have long, curly, thick hair.) If I wait to comb until after baking soda or after the shower, not a pretty picture! my hair is really dry after my 2nd no poo.. sounds like it's either from no pooing too soon (every other day) or could my mixture of bs be off – can too much bs cause it to be dry? It's possible that it's because of the every other day but it's more likely to do with ratios. How much baking soda are you using? Another thing is that perhaps you are not using enough vinegar. The general ratio is 1tbs in 1 cup of water but some find they need more. My hair needed a 50/50 ratio in the beginning and it's gradually gotten to be less over the last 2 1/2 years (now it's 1 part vinegar 2 parts water). If I do not use that much vinegar then my hair is pretty dry, lots of fly aways, etc. If you are using the usual 1 tbs baking soda in 1 cup of water, and you are using the 1 tbs vinegar in 1 cup water, I would first suggest upping your vinegar amount a bit and see if that helps. Usually the baking soda isn't a problem if it's at 1 tbs. ok no poo'ers.. I've always had light dandruff, but the last couple years it has gotten really bad. I've been thinking of trying this for a while now, but feel tied to my dandruff shampoos (that don't really work). Has anyone with dandruff tried this with any success? I've heard of many no 'pooers have success with getting rid or lessening their dandruff with no 'poo. I know it's made a dent in mine (we also use a chlorine shower filter which helps with dry skin/dandruff). Of course the problem with dandruff is that depending on why you have dandruff, no amount of external changes will help (if it's diet related) However I still think it's worth giving no 'poo a shot. I'm super confused. I thought you were the one who advised me to drop the vinegar and baking soda out completely, which is did. But now that I found this post, it seems like you still use it? How did I misunderstand?! Hope to hear back from you, curious to know what your routine is now? Oh, also, I'm getting married and think I will have to use some kind of hairspray/ mousse. Any suggestions? I just have it in my head that if I use it once I'm going to have to start this all over again!? I'd suggest doing no 'poo with the usual baking soda/vinegar ratios every now and then. Maybe every 3-6 days. Thanks so much! Before I heard back from you I put a bit of vinegar and water through my hair in the shower. I can't believe how it changed the texture. Much nicer to touch! I still haven't put baking soda in. My hair is so dry and frizzy. I figured the best way to tame the frizzies was no baking soda at all. I can see from this pic that our hair is very different, but do you suppose if I did the no poo wash once a week I'd get a little more shine and a little less frizz? Can I recommend Shikakai powder. Shikakai is an indian herb that stimulates and condtions the scalp. It costs $3 or so on Amazon and you can treat or wash with it. Im sure you can even add it to your baking soda mixture. There are several other Indian herbs you might like to try such as Amla, Neem, or Brahmi. You can even do a tea rinse. There are instructional vids on You tube as well. Just a suggestion if you need extra shine, strengthening, or conditioning. Thanks trendfoxx. Shikakai powder is actually listed in my alternatives in my No Poo Troubleshooting post! Awesome! I'm going to do a vinegar and chamo tea rinse. Highlights would be nice 🙂 I'm marrying in an apple orchard and the thought of putting sugar on my head where there are already plenty of bees is a little scary…! What do you think? Hmmm well in that case, you might want to be safe. 🙂 Wouldn't be good to have a swarm of bees attack you while getting married! There are other homemade recipes. There's one that uses lemon (which if you are looking for highlights) that should work. I haven't tried that version but I'd assume it works well. Hi, awesome blog (going to try the homemade deodorant). Just wanted to weigh in with our No 'Poo experience plus some helpful science behind it (I work in the consumer products industry as an engineer). My wife and I have been No 'Poo for over a year and it has done wonders for my eczema. Less itchy, less flakes. When I'm really in a hurry I'll use shampoo diluted in a cup of water, keeps it from concentrating on my scalp, but no more than 1x/week. On the science end, shampoo is a detergent which is how the oils are cleaned out of your hair. The oils (fatty acids) on your scalp are acidic, so using baking soda actually saponifies them to a degree (as well as neutralizing them). That's the cleaning action. Unfortunately, it's not a true soap, so it doesn't work on some of the polymer-based hair products most people use (not sure about homemade hairspray). The baking soda also is very basic (high pH), which causes the outer layer of the hair shaft (the cuticle) to open like scales which then catch on other hair and causes tangles IF you don't use something with a pH of around 4 (like most conditioners, though that's not all conditioners have in them). Thankfully, vinegar is exactly that pH, so it closes the cuticle and allows the hair to maintain moisture and not tangle. I imagine those that have long hair would just need more vinegar solution to effectively coat their entire hair shaft enough to close the cuticle sufficiently. Wow and wow!!! I'm curious how one of the previous comments said she went no poo with her kids as my daughter is almost 2 and I'm worried about getting it in her eyes…any good recommendations for that? I also didn't know about the chamomile and highlights…sounds good to me! The science behind it from the comment above is also really cool!!! Thanks for posting all of this info!!! Have you seen my no 'poo troubleshooting post? http://www.pistachioproject.com/2010/09/no-poo-troubleshooting.html That offers some tips. Does your hair fell yucky right after a no 'poo or is it just days after a no 'poo? If it feels yucky right after then we can troubleshoot. If it feels great right after but then the days following it feels yucky then that's just detox. Is there a reason why you skip the vinegar part? I don't think that adding vinegar will necessarily help your situation but you do need an acidic rinse after the b/s so that your hair's ph levels are restored. How often are you no 'pooing? Do you still condition using no-poo? I'm new to this so i want to check. Ashley – with this method (the baking soda and vinegar method) the vinegar is your conditioner so you do still condition but it's with vinegar. You do not use traditional conditioners however. What do you use as a baby shampoo/body wash? I was thinking of trying Dr. Bronners, but worried about if it gets in his eyes? baby stuff – we use just water only or if they need a good scrubbing then just a drop of Dr Bronners mixed into the tub water. Just tried this for the first time…still sitting here with the towel on my head afraid to take it off and smell the vinegar! haha! Not sure that will make my pregnant self feel sick…haha! Oh well. Hoping for good results, I have long, thick, wavy hair. I just took the plunge, and went no 'poo. I had been doing low 'poo for almost 2 years before now, and I was going 4 days between washes. I adjusted the baking soda and vinegar ratios for my hip length curly hair. Holy cow! I can't believe how clean my hair my hair got with just the baking soda. I even had less trouble combing my hair out. Thank you for posting this. So I was kinda worried that 1 tbsp and 1 cup wouldn't be enough. Because I'm used to lots of shampoo, and lots of bubbling. SO, that being said I added more Baking soda than recommended and used regular conditioner my first time ( because the thought of vinegar in my shower is just… weird. ) and it dried my hair out. Next time I used the amount correctly, in the recipe and it worked fine. So if you're worried about not having enough cleaner, and not having the right qualities to wash your hair, try this recipe first before you intervene. Tangles are not fun. Especially with longer hair. Very true Morganne. Always start with an original recipe and then tweak if necessary. That being said, if you did feel you needed more of the baking soda mixture, I recommend doubling the batch (so 2 tbsp in 2 cups) – that is what I recommend for those with really long hair or lots of hair. I've tried no poo with BS + acv for a week and half now. Love the result for my fine thin hair. You might need to do a double dose of b/s if you do an oil treatment. I personally have not ever needed to use an oil treatment since starting no 'poo so I have yet to actually experiment with it. I have done oil treatments on my son and when we do I usually use castile soap on his hair to get the oil out. Hi! I was just curious if I could just use a chamomile tea as a full replacement for acv? I used acv before and it stripped my hair color and it turned brass-y. You can use chamomile tea as a full replacement (no diluting obviously as you are already making tea) It may or may not work for you… my hair likes a high acidity and tea is a bit too weak for it but for some people it works just fine. A Boar Bristle Brush REALLY helps. 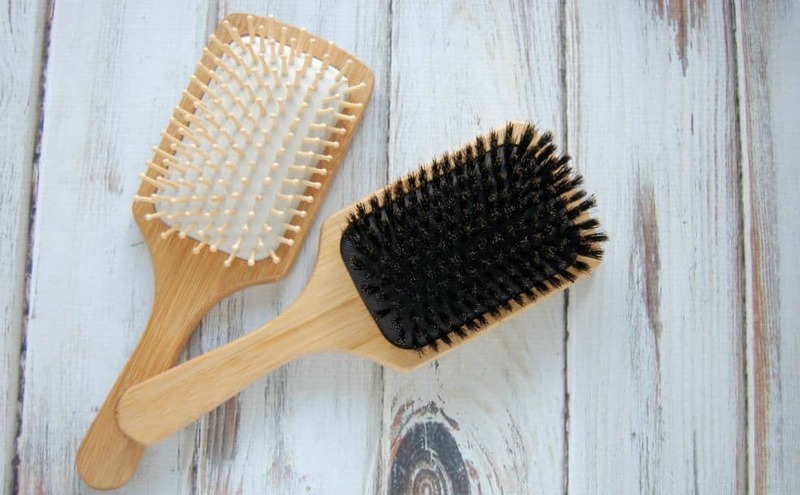 But if you do use a BBB than make sure it is 100% Boar Bristles. I can sit on my hair and I was really worried about the tangels but it really does help. After going No-Poo I find I can leave my hair down all day and it won't get knotty as long as I'm not doing anything too active; or I just keep a ponytail on my wrist so that when I have to do some excercising I can just quickly tie it back. ACV is said to really help too. I don't use it though I just use water. Hope that if you do try it that it goes well for you. I started trying the no 'poo method last week! I am loving getting rid of the junky chemicalyy shampoo….it has a ton of stuff in it, its so scary to look at the ingredients list and have no idea what those things are! Anyway, so I am having some challenges with the no 'poo method, and I am trying to troubleshoot them,with the help of you other link. So I did the standard 1 tbsp BS:1cup water, 1 tbsp vinegar:1 cup water, my hair lasted 3 days. I HAD to wash it on the 3rd day, it was greasy. Second time around, I added some honey to BS and did 1/2 cup vinegar:1/2 cup water, almost similar results, 3rd day my hair was greasy. The thing is I always used pantene shampoo, and i could go without washing my hair for 4 days maybe..so the shampoo wasnt making my hair oily at all, it seems that the more natural route is making my hair more oily. Could this be just part of the detox process? So my scalp is like what the heck are you doing? Also, my scalp feels a little itchy after washing, I try to scrub in the BS mixture, but I don't know…I don't want to add much more BS than 1 tbsp bc I don't want my hair drying out. Please give me your input on this. I was soooo motivated to go 6 days without washing to get the detox done quickly, but thats soooo friggen hard, without looking like a disgusting oily mess…. I think it's pretty normally to not be able to go as long as you used to with Pantene. 3 days is still good. As for the itchiness, you might want to make sure that the baking soda is almost fully dissolved and make sure to rinse really well. Usually it's baking soda that causes the itchiness and so you might need to tweak that a bit. Hey Brit, what do you think of Black soap shampoo as an alternative to regular shampoo? It's all natural..have you tried it? It's made of ashes, shea butter, coconut oil…the ashes is like the lye, you get some foaming. Also, do you think I can follow with a vinegar wash after using such a shampoo? Thanks in advance! I would imagine it will work like using castile soap. You can do this but usually castile soap doesn't work perfectly. If you do use it, then definitely follow with a vinegar rinse. Your hair will need it. Hi Brittany, I was wondering if this method is safe on highlights? I usually get my hair highlighted every couple of months (or try to every couple months. usually turns out to be 4-5 months) and am curious about no 'pooing, but am worried the vinegar will mess with the color. Do you know anything about this? I actually started no 'pooing when I had highlights in my hair. I never had any issues. Normally I relate no 'poo to washing your hair with a "normal" shampoo (as oppose to the "for color treated" ones) This means that it may fade faster. It's also possible that the color will "take" faster as you are removing gunk on your hair. I've not heard of any issues with applying color but it's something to keep in mind.